Village Crown Cinemas appointed Krix as the loudspeaker supplier and consultant, providing a no-compromise sound experience for this new audio format. Traditional Cinema uses Dolby 7.1, which includes 3 screen channels (centre, left and right) and 4 surround channels, side left and right, rear left and right, plus one subwoofer channel. The new format escalates this to Dolby 61.3. This includes up to 5 screen channels – left, inner left, centre, inner right, right and up to 56 surround channels. These are located around the side walls – from close to the screen to the rear walls, rear walls and two rows mounted in the ceiling again from the screen to the rear of the auditorium. The ‘.3’ indicates that there are 3 subwoofer channels. There is the traditional subwoofer(s) located at the screen end, plus two additional subwoofers mounted either side of the auditorium to cater for the low frequency content of the surrounds. These two additional subwoofers were placed at close to ceiling height (see top image for placement) and provide surround frequencies down to 40Hz, and the screen subwoofers provide frequencies down to 25Hz. All the loudspeakers/amplifiers have stringent technical specifications as they must deliver high sustained SPL’s at defined reference points in the auditorium with a bit of headroom, with defined coverage angles to cover the whole audience efficiently. Dolby Atmos has specified a reference point that is located on the centre line of the auditorium 2/3 the way back from the screen towards the rear wall. All target SPL’s need to be measured at that point. All specified SPL’s are of a continuous basis which means that the loudspeaker /amplification system must be able to sustain this level on a continuous basis. These levels are defined as 105dB SPL from the screen channels, 113 dB from the screen subwoofer channels 99 dB from each of all the surrounds channels and 105dB from each of the surround subwoofer channels. Additionally this new format departs from the traditional Dolby 7.1 as each surround loudspeaker is essentially a discrete audio channel driven with its own separate amplifier. This is the absolute essence of the immersion sound that Dolby has devised. As you can imagine, this new format gives movie makers an amazing new tool to enhance the audio experience in cinema. As this format is scalable to the size of each individual auditorium, this particular installation uses 5 x KX-5956 3-way screen channels and 34 surround loudspeakers that include 8 x KX-1152 and 26 x KX-1570. To deliver this demanding SPL the surround loudspeakers need to be scaled up in power capacity and efficiency. To this end the traditional surround loudspeakers often used is based on a 10” bass driver, however for this installation 12” and 15” Bass drivers (with horn loaded high frequency components) were required. For this new format Krix needed to design a new form of surround mounting brackets which give two axis of rotation allowing angles of up to 60 degrees and capable of supporting rather large surround loudspeakers, especially those located close to the screen. The screen subwoofer channel comprises of 4 x KX-4610 and the surround subwoofers are 2 x KX-4210 – one on each side of the auditorium. As you can imagine with all this capacity the overall system capacity is immense. This installation is a substantial upgrade for Village Crown Auditoriums 5 and 6. The installation is now complete and is open to the public with its first feature film “Spider Man”, and from the trailers it appears that Godzilla will be worth catching when it is released. 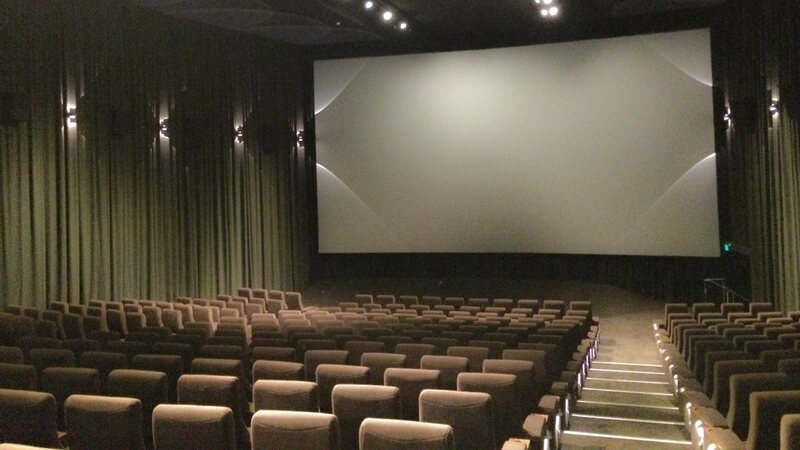 Krix have now provided the total loudspeaker compliment to five Dolby Atmos Cinemas worldwide. The other installations are located in Beirut and Dubai, with two more being installed in Oman at present. “Inside viewing/listening hint”. The reference point is located in the middle of row K, but anywhere close to that point will give you the best sound in the house. Make sure you get there early enough to experience the Dolby trailers that show case the new format.